Get your weekend off to a flying start! 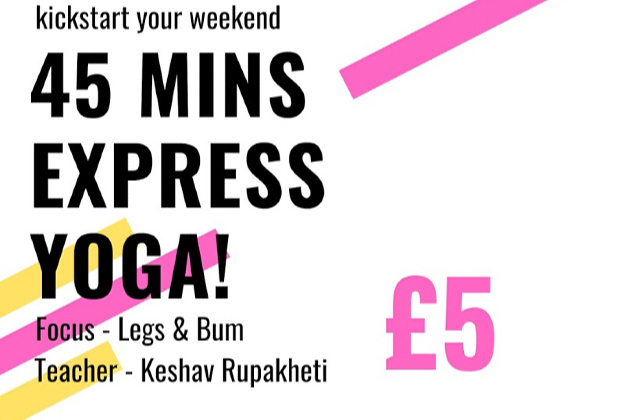 These 45mins Express Yoga Classes will be on once month. A full body workout Yoga class with a different focus each month. This month is focused on LEGS & BUM. Keshav Rupakheti teaches this Yoga Class. If you are unsure which class is for you, feel free to chat to Keshav or Jennifer 07966912953, they will find the right class for you. Thank you for booking your class at Namaste Yoga Centre. We look forward to sharing our Yoga knowledge with you. Please arrive on time for your class. Please bring all your personal belongings into the Yoga room with you.